When I was new in advertising, I read somewhere that for an ad to get attention, there were several tricks. One of them was to use animals. After years of watching commercials, I'd have to agree. Who doesn't love a pet who can act? For me, the most outstanding use of an animal in a recent TV ad would be Bridgestone's Dog from BBDO Bangkok. 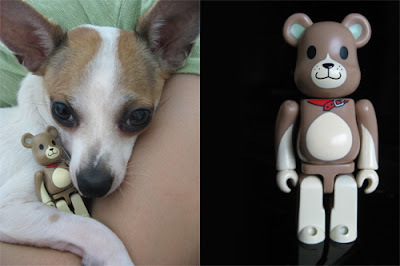 My dog, Kenzo (above, left, cuddled up with my 2006 Year of the Dog Be@rbrick, an exclusive for the Hong Kong Be@rbrick Fan Club), is cute and talented enough for the tv screen. Aside from knowing how to fetch his rubber ball, he can express different emotions: 'excitement' when he plays 'bite that finger', 'defiance' when he refuses to get down from my bed, 'shame' when he knows he made 'poopoo' where he shouldn't, 'fury' when he sees our neighbor's noisy little chihuahua, and 'sweetness' when he rests his head gently on my arm when I am sleeping.